Churches across the country are taking to the streets to protest the increasing incidents of killings as the Christian Association of Nigeria (CAN) declares a national day of protest. 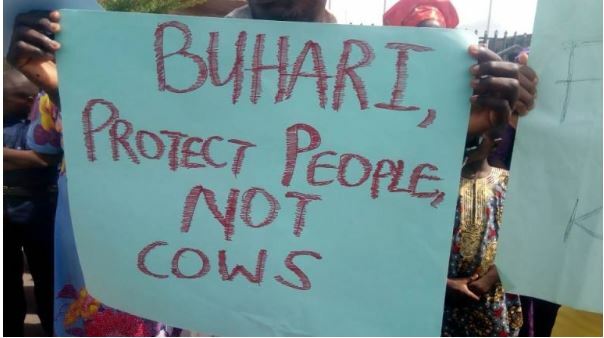 The churches are making demands on the Muhammadu Buhari administration to stop the incessant killings by herdsmen and persecution of Christians across the country. As led by Olasupo Ayokunle, the president of the Christian Association of Nigeria (CAN), the churches are also asking for the release of the Chibok girls and Leah Sharibu, a young girl kidnapped by Boko Haram from her school in Dapchi. It was earlier reported after the return of the Dapchi girls, that Boko Haram had failed to return the young girl because she refused to renounce her Christian faith. John Akin Oyelade, the pastor in charge of one of the churches involved in the demonstration, Fountain of Peace Baptist Church, Oyo, said Christians have given the government enough time to act. “Having exercised the very patience expected of a true believer by praying and looking forward to what any responsive government would do in this unpalatable situation against fellow mankind, it could be observed that we have given enough time for administrative exigencies and should our quietness be taken for a ride, then more than what Christians are known for may begin to unfold hence, this peaceful protest,” he said. “Nigeria is a secular state, and as such, it should be treated as one, we condemn outrightly the lackadaisical, irresponsible and irresponsive attitude of this administration towards this menace. “I must be true to you, to myself and to my God that the current administration of today does not possess any form of what the true heroes of past of this nation handed down, it also denies the spirit and the power of fair leadership and respect for human lives. Oyelade added that “the political ground among us has been directly affiliated to a particular section of the country as seen in the various lopsided appointments in various government parastatals; thus, defying the interest of the remaining region and the Christians as declared in their various sworn oath”. “To this end, there is a need for obeying the instructions and directives by the CAN leadership to stage this peaceful protest. In the face of the deplorable state of governance in Nigeria today, it has become imperative that we raise our voice against this barbaric and nepotic acts in a godly, peaceful yet in a highly demanding manner. “We have discovered that it is no more an accident neither is it a coincidence but a Programme and an Agenda which may be presumed to have sponsors. “It is essential to establish that the situation is becoming worrisome day by day. It is also worthy of note that up until this moment, no significant position has been taken by this government, despite the frantic efforts made by the leadership of the Christian Association of Nigeria, through her President. Unfortunately, all efforts to discuss with the government has yielded no result.